Kelly M. O'Brien, Playing With Fire No. 73. Paper, gold leaf, flame. 102x76x6 cm | 40x30x2.5 inches. ©2018. When I decided to pursue my MFA last year, I knew there would be times like this past month when I would just have to power through a pile of work and competing deadlines. Between client commissions and major projects due for school all at once, it's been a bit of a manic May. And even the best-laid plans...well, we know how they go. Thankfully, I had an abundance of support in the studio, at home, and at school. Shared below are some of the fruits of our labor. With a bit of a breather before more projects start up and the next school term begins mid-month, I look forward to welcoming what's next feeling refreshed and ready to roll. I hope your summer is off to a refreshing start! New Commission for Daniel Fine Art Services and Linda Snyder Associates, Inc. I'm very pleased that I had the opportunity to create a new piece for a hotel, which shipped this month. This project came from the lovely team at Daniel Fine Art Services via Linda Snyder Associates, Inc., with whom I have been working since the end of last year. Their project portfolio is chock full of gorgeous projects and I'm excited to be collaborating with them. 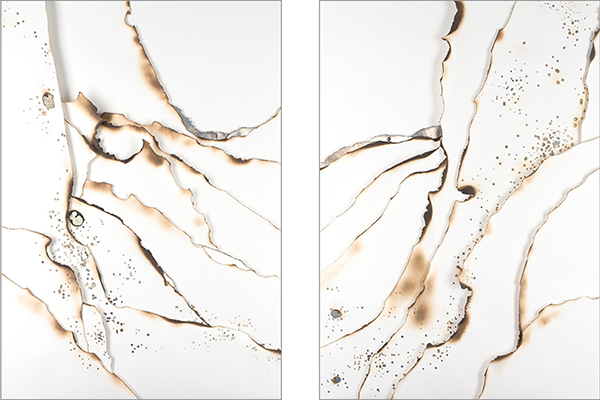 Kelly M. O'Brien, Hand-embellished prints (Playing With Fire No. 25 and 26). Hand-burned digital images on paper with gold leaf. 183x122 cm | 72x48 inches each. ©2018. Also this month, we completed and shipped two large hand-embellished prints (HEPs) for the lobby of the new Modera Central mixed-use property in Orlando, Florida. Normally for HEPs, we have the burned parts of the image laser cut and then back them with archival brushed gold paper. This project ended up being a little fancier than anticipated since there are apparently no laser beds large enough to cut prints this size (6 x 4 feet) in the UK. We ended up doing all of the cuts and burns by hand and then backed them with 22.5K gold leaf, a special option for HEPs. A big thank you to the team at Carlyn and Co. for finding me via the Torpedo Factory (an amazing art center and my old stomping grounds in Northern Virginia, US) and for the opportunity to take on this challenge. It really is a small world! I just wrapped up the 2nd term of a 2-year MFA, capping it off with an in-studio exhibition of my work and a fat research binder to back it up. The research process has been eye-opening! More details and images here. For more studio shots, follow me on Instagram! July Studio Update: Hello Summer!